*Disclosure: I received the use of a vehicle in exchange for this post. The opinions expressed here, however, are my own. After this past week dealing with Michigan weather, I can tell you this: my next personal car will have heated seats in them. 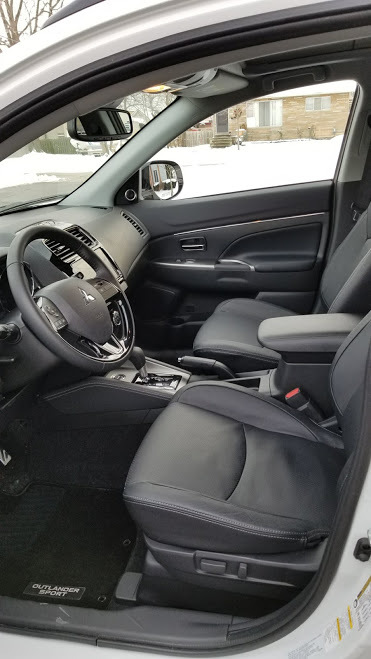 The 2018 Mitsubishi Outlander Sport, which I drove this week, did have them, and they were so nice to have—the weather today was "-2, feels like -18 degrees" when I woke up this morning, so I was definitely missing this vehicle. 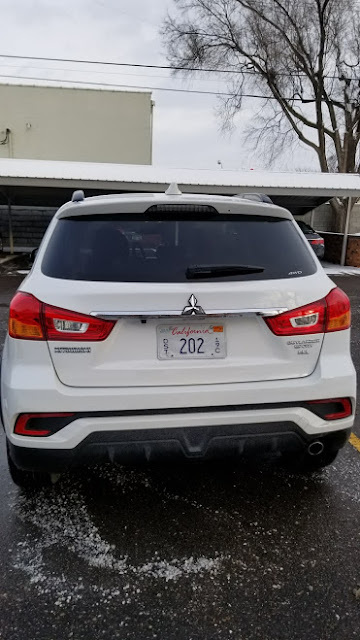 One of the first things I noticed about this vehicle is that it "tucks in its ears" (side mirrors) when you lock and unlock the doors. This is a very cool feature and one that I'd recommend all vehicles to have—the chance of your side mirrors getting hit is therefore minimized. 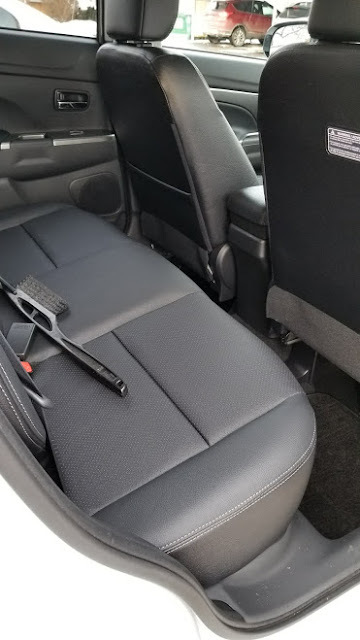 The cargo space in the Outlander Sport is decent. 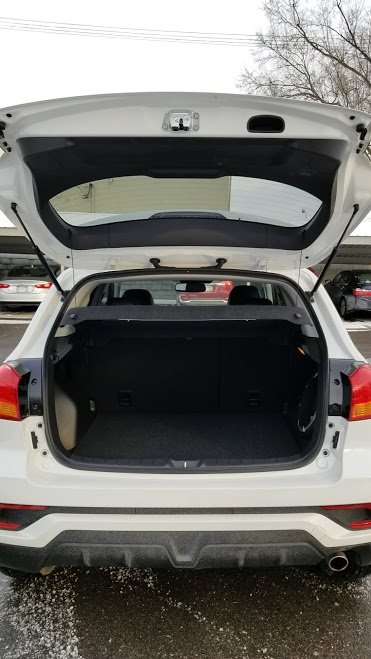 I had looked up reviews of the 2016 Outlander (not sport), and the cargo space seemed very small; in this model, however, there is plenty of room for luggage, which was good because we drove the Outlander Sport to the Kalamazoo, MI area over New Year's weekend to visit friends. 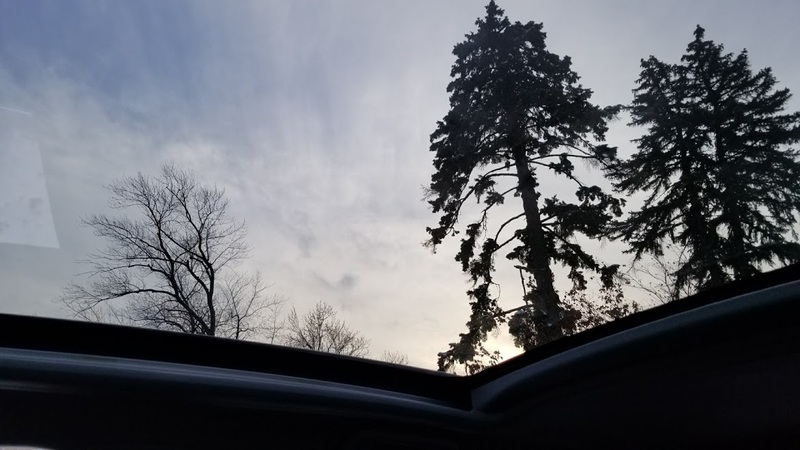 The model I drove had the Touring package (an additional $2,000) which includes Forward Collision Mitigation, Lane Departure Warning, Automatic High Beam, a premium audio system with 9 speakers, and a Panoramic Glass Roof, which is pictured above, and went throughout the whole car. 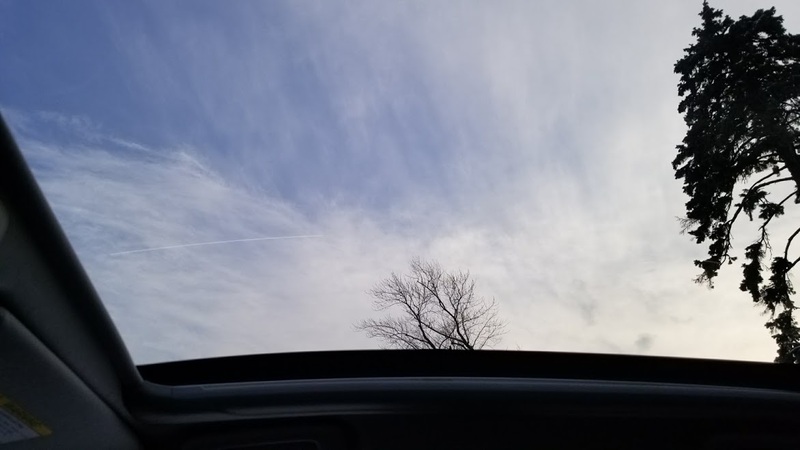 I don't believe it was a sun/moonroof, however, because it doesn't open. The car seats five people (two in the front, three in the back), and I believe the back seats can be folded down, too, for more trunk space. Our friends sat in the back when we went to pick up some takeout pizza, when we visited them, and said it's a comfortable backseat area. This car does not have the automatic cruise control, which I found out when I took it on the highway. 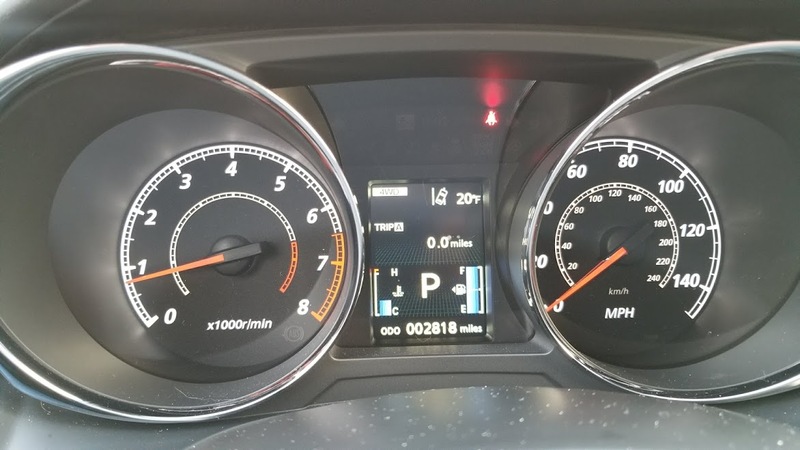 It does have your standard cruise control, though, as well as an indicator that will beep if you go over the road lines. The Outlander Sport has an average of 25 miles per gallon, which includes 23 city and 28 highway. 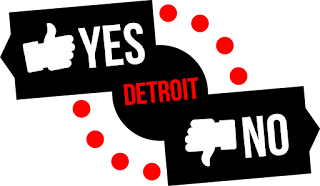 From Clawson to the Kalamazoo/Portage area is about 150 miles one-way, or 300 round-trip. I also went to/from a friend's place in Waterford the day before, which was about 40 miles round trip. To make sure I was able to get back to Clawson without running out of gas, I added $10 in gas, and when I got back to my place, I had about 50 miles left in the tank (the car tells you how many miles are left, which is a nice feature). 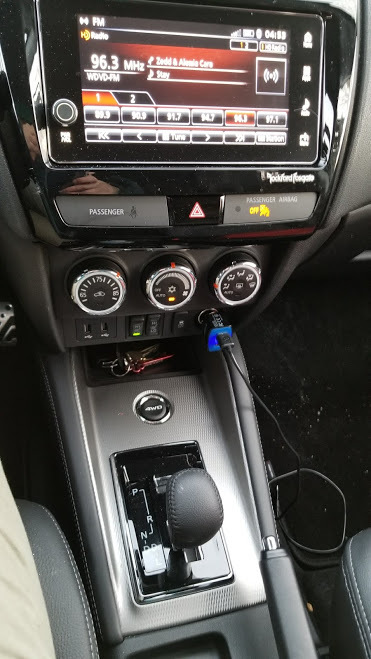 The car did not have navigation, but did come equipped with Sirius XM satellite radio, which was nice to have when going out of town. 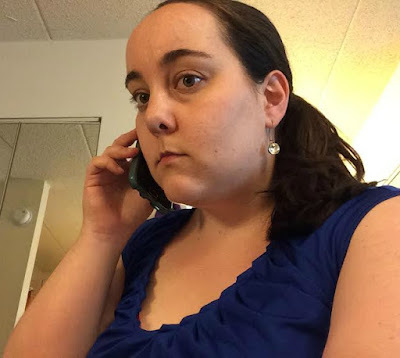 The color of the car I had was Diamond White Pearl, also, and it was a very pretty color. I'll also say that the phone call quality in this car is amongst the best—if not THE best—of any vehicle I've ever driven. One of the first things I do when I get into a vehicle is connect my phone to Bluetooth and make a phone call, and it almost sounded like the call was over WiFi ... very crisp and easy to hear. Buttons for Lane Departure Warning, etc., which can be turned off if you like. 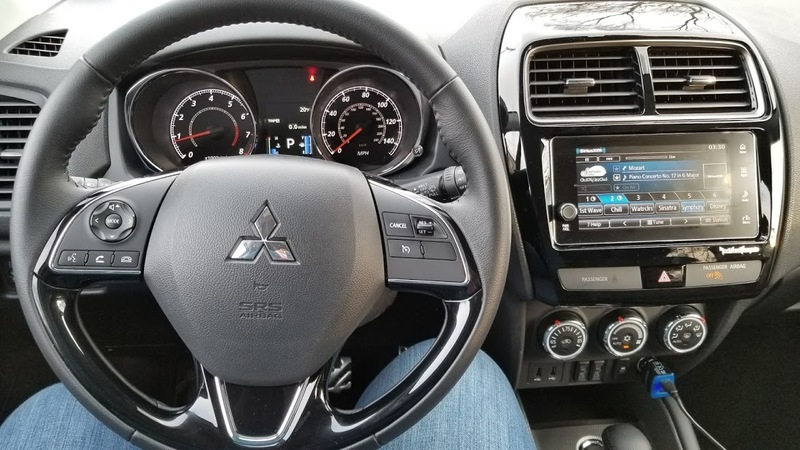 This was my first time driving a Mitsubishi vehicle, and overall I liked it. Although it didn't have as many bells and whistles as other cars I have recently driven, I loved that the side mirrors "tucked" themselves in, and the touchscreen panel (with radio, Sirius XM, and other apps) had a nice interface. I also appreciated the heated seats, and the driver's seat area was comfortable to sit in, too. 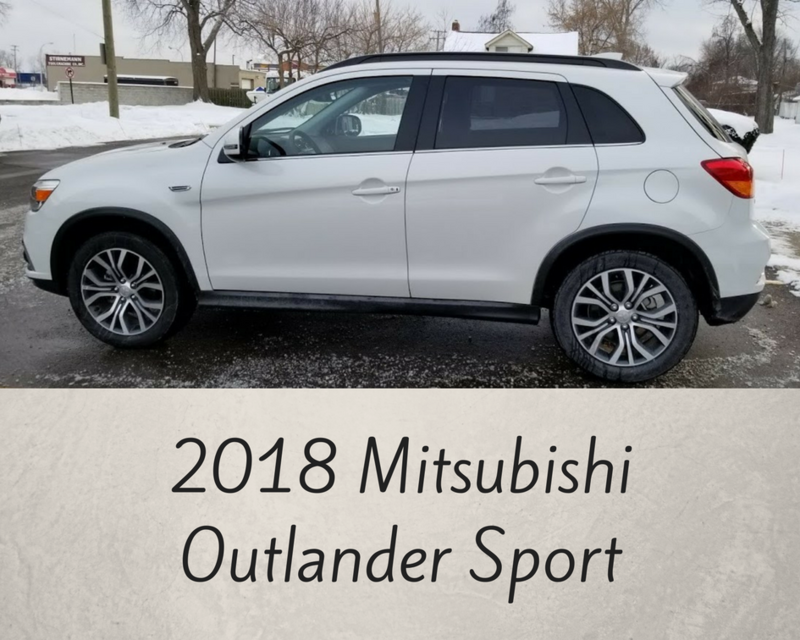 The SRP of the specific model I drove (2018 Mitsubishi Outlander Sport, with the Touring package) was $29,310, but the 2018 Outlander Sport starts at $20,395. Glass roof - comes with felt panel that can be opened or closed. Have you ever driven a Mitsubishi? If so, what has been your experience with it?